I have been a long time fan of Cecilia Ahern. In fact, one of her first books, Love, Rosie, is one of my favorite books of all time. YA dystopia is a new genre for her, but Perfect is the second book in the Flawed series. I read Flawed in a day, maybe two, I was so into it. The book was about a society of people who are branded in places on their body depending on the crimes they commit, which is what supposedly keeps their society in line. Celestine bucks the system, and it's up with a special 6th brand that was never given before and given by someone who wasn't supposed to give it. 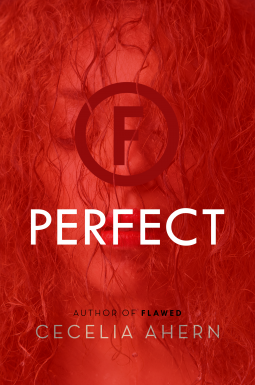 Perfect is the continuation of that story and about Celestine trying to fight for justice for what was done to her and the other "flawed" people in her society. I found this book to be the same as many second books in dystopian series...wordy and descriptive and not as compelling as the first. It was still an intriguing book and had a resolution at the end, which makes me wonder if another book is necessary or on the horizon, but these types of series usually happen in threes and #3 is usually a little more action packed than #2 so we can only hope that we will get a conclusion to this book. I think Ahern's foray into YA has been a successful one thus for and I would love to see more from her in this genre.